Ready to hit the ground running. 10 pairs of top-quality Physical Training Shorts, all gently pre-tested by members of the German Bundeswehr. Stay cool as a cucumber, even when you're giving 110% to the mission ahead. German Military Surplus Shorts, 10 Pack, Used is rated 3.8 out of 5 by 22. 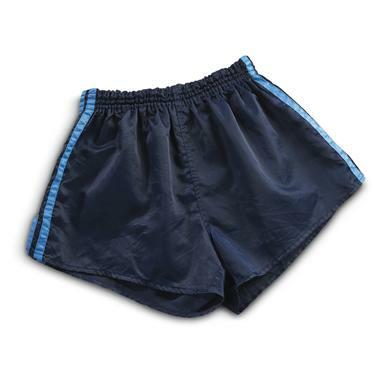 Rated 5 out of 5 by HawaiianPyrate from Great Price Real Value Unbelievable value absolutely perfect shorts at a price that would be low for secondsShort are well made using quality material. May run a tad small. Rated 4 out of 5 by Dave from Order them just for the price Size is true for me. They are a bag of shorts, all the same color, some have pull strings, some don't. Rated 1 out of 5 by Metlsmth from Used German shorts Used shorts were more than used. almost completelyworn out with elastic that has been stretched almost beyond use.Not a good deal by a longshot. Rated 3 out of 5 by Albe from Not so great German Military Shorts Three of the shorts had crumbled elastic waist band. Three had no liner and were of a different fabric. Rated 5 out of 5 by TX_Cowman from Really Comfortable Shorts Love the shorts. Most of them have no inner support but are just plain shorts which I love. I usually cut out any liners anyway. Real silky cloth feels great against your body. Rated 1 out of 5 by Nobby from Worn Out Shorts were listed as NEW when ordering. Received mostly rotted elastic in waist, old used used up shorts that stunk of mold and mildew. Thanks Sportsmans Guide for superb Customer Service. Rated 5 out of 5 by ROBERT from Excellent value -- quality construction of the shorts.